The long and difficult task of recovering the wreckage was compounded by the terrain the plane crashed in. The plane was buried up to 15ft in wooded bogland in a remote area, presenting challenging conditions for the recovery crew. A single bog railway winds its way from the narrow road, and it was along this that the emergency services, Air Accident Investigation Unit, and recovery vehicles had to travel. 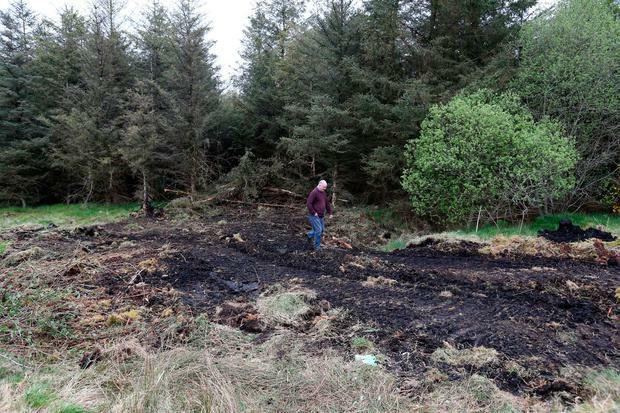 The harrowing picture of the efforts to drag the crumpled wreckage out of the bog to get to the two people trapped inside was painted by one local man at the scene. "The bog was sucking it under. That's what it does," he said. Using a digger and chains, locals with access to heavy machinery spent six hours battling to retrieve the bodies. "We got chains around the tail, but when we'd try to pull the plane out the chains would cut through it. I was surprised at how light the metal is on them," said the man. "Then we'd try and anchor the chains somewhere else and try again. It was nearly impossible," he added. Eventually, in the darkness of the trees and the fading light, the bodies of pilot Niall Bowditch and passenger Kacper Kacprzak (7) were removed from the plane. The job of mapping the scene and transporting the wreckage began yesterday morning. The stricken plane lay in three sections after being pulled from the bog. One of the wings had sheared off in the woods just before impact. To the naked eye, the damaged section of the plane, made of light metal and painted blue and white, was all that could be seen of aircraft G-KNYS. Local Fine Gael councillor Liam Quinn called the tragedy "a very black day for Offaly". "I'd like to extend my sympathies to the families and our thoughts are also with the members of the parachute club," he said. "These flights have been happening for the last 20 years and this is the first time I've heard of a plane going down."